Farmer’s Market’s are something that is relatively new to me. The last place I lived had only one and it was at a time that wasn’t very convienent. Since moving to Michigan, I’ve done a lot more shopping this way and love it. We were in Ann Arbor to do some shopping, but first, we hit up Zingerman’s Deli (review HERE) for lunch. 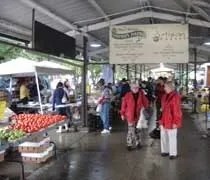 As we were driving around looking for parking, we passed the Ann Arbor Farmer’s Market and realized it was close to the Deli. After a delicious lunch, we walked down the street to see what the local Ann Arbor farmers had to offer. The first thing I noticed was the abundance of peppers. It must be that time of year because every table had a lot of peppers ranging all over the scoville scale. I looked at some habanero’s and some red peppers, but ultimately passed because I didn’t know how long we were going to be in town or how hot it would get in the car. If you’ve been to Zingerman’s Deli, Zingerman’s Next Door shouldn’t be hard to find. It’s right next door. The shop has two purposes. First, it’s seating for Zingerman’s Deli. As I mentioned in my REVIEW of the deli, after you place your order, you go next door and have a seat. A server will bring your sandwiches and you can sit down and enjoy the biggest deli sandwich you’ll probably ever eat. 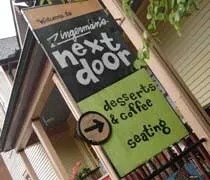 The second purpose of Zingerman’s Next Door is to offer things you can’t get at the deli. The main focus is coffee, but they offer chocolates and even gellato. 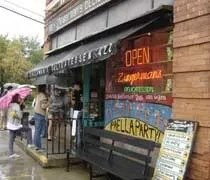 Since we’ve been in Michigan, the one place I’ve been wanting to eat at is Zingerman’s Deli in Ann Arbor. I can’t remember how I first heard about it, but it’s been on my short list for a long, long time. I’ve passed the last two times I was in Ann Arbor because of time constraints. Today, J and I took a shopping trip since U of M was on the road and the first thing we did was find Zingerman’s Deli. Zingerman’s is in a unique area of Ann Arbor known as Kerrytown. Very narrow streets not far from downtown. Across the street, sorta, sits the Kerrytown Shops. There was a lot going on in the area on a Saturday morning. Not only was the Farmer’s Market open, but there was a festival going on in the school lot near the Deli. We drove around for almost twenty minutes before we finally found a spot to park on 5th Avenue. It was raining pretty hard, but that wasn’t enough to keep me away from the biggest sandwich I’ve ever gotten at a Delicatessen.